IT may be a field already inundated with big players but there’s no doubt that redONE, one of the latest entrants to the telecommunications industry, has a lot going for it. 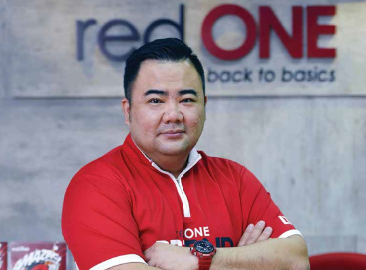 At a recent interview, red ONE Network Sdn Bhd Chief Sales Officer and co-founder Ben Teh said that when the brand was launched in June 2012, the forces behind it realised that survival was reliant on being different from the other major players in the market. “It isn’t easy to be different but we knew that if we didn’t try something new, there would be no chance for survival. That was why we adopted a “back to basics” philosophy, which customers will realise is also our tag line,” he said. The philosophy extends to just about everything, including its plans. Teh said that redONE threw its hat into the ring by unveiling a postpaid plan (it only ventured into the prepaid market in December 2016) in June 2012 that was the lowest in the market. “The Red Plan 8, which is priced at RM8, is very much in keeping with our philosophy of back to basics. There is no doubt that everyone could afford it. While working on the plan, we asked friends and family what customers would want and the answer was free calls, thus the plan offers free unlimited calls between redONE postpaid users. Our success is related to the fact that people were curious about a new company that was offering such a great deal,” he said. He added that redONE has evolved over time to keep abreast of market demands. In addition to the Red Plan 8, a voice-centric postpaid plan, the company has launched its Amazing postpaid data plans which consist of Amazing 8 (1GB), Amazing28 (10GB) and Amazing48 (20GB) to cater to the rising mobile data needs of its customers. With such an ingenious plan, one also needs a great sales network to bring it to the attention of prospective customers. Once again, redONE devised a unique way to grow the brand – by securing the help of a dedicated team of sales partners. “When you have a good product, the next question you have to ask yourself is how to entice your competitors’ partners so that they will sell your product. As a new company with limited resources, we decided to be different by offering our partners a perpetual income sharing plan – we’re the first telco company Sky’s the limit for redONE in the world to do so. While this means that we pay them a relatively smaller amount upfront, they are assured of income for as long as their customers pay their bills,” Teh elaborated. That the telco has enjoyed a successful streak is apparent by the fact that it has secured about 10 per cent of the postpaid industry. There are big plans to increase its services for subscribers but the focus will always be on customers with an eye on savings. “Our plans will always be below RM50. With so many hotspots throughout the country as well as Internet services at home and in the office, we believe that you don’t really need to spend so much on data for your mobile devices,” Teh said. redONE launched its RM10 prepaid plan in December 2016 to offer more to customers looking for value-for-money deals. “The prepaid market is large as at least 70 per cent of mobile phone users subscribe to prepaid plans. We’re planning to introduce more plans but we’re happy that we already have 80,000 subscribers on the RM10 prepaid plan, which is the cheapest in the market. Our customers enjoy unlimited free calls between redONE prepaid users and even better, if they run out of air-time, they can still make free calls to other redONE prepaid numbers. This is a critical function – especially for the elderly pak cik in the kampung, who if he has a fall, can use the line to contact his children who are on the same network even if he’s run out of credit,” Teh said, adding that the redONE prepaid plan also includes free 500MB data usage every month and a 30-day validity period regardless of the reload value. This “dare to be different” approach is also seen in the way redONE registers its new customers. “We realised that paperbased forms were not environmentally friendly, quite aside from the fact that going paperless would be less tedious and would help to prevent human error. We’re the first telco to introduce mReg, which is a paperless registration platform that is done with an Android tablet. It enables our partners to conduct registrations easily as it includes features such as MyKad rendering, barcode scanning and photo attachments. We implemented the system three-and-a-half years ago and we’re 100 per cent paperless now – this demonstrates the company’s commitment to being green,” Teh said. Indeed, the sky’s the limit for redONE as it plans to spread its wings throughout the ASEAN region. “We’re the first mobile virtual network operator (MVNO) to expand its business outside Malaysia. We aim to commence operations in Singapore and Indonesia this year, and this will be followed by Vietnam, Thailand and the Philippines. This is in keeping with the company’s vision of becoming the largest MVNO in the region by 2018,” Teh concluded.